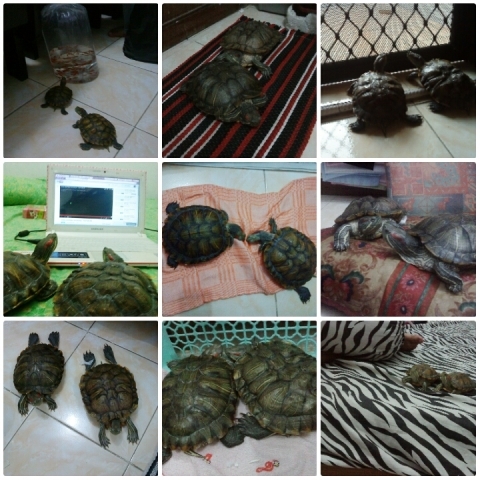 KB | See, how cute my turtles are ♥ - Lisa Maulida R.
Hi. Is there any of you have a turtles? I have, a pair of turtles. They really have and seems love each other, of course they are. They grow together, play together, eat together, sleep together. And you know, the feeling while I watching them sleep is like my stomach fill with flowers and butterflies. So cute! Caca is my first turtle and Live is the second. Caca has 4 years old in last October. Live reached the age of 4 years in February next year. They are so clever and adorable. I will let you know about them. They were so tiny, right? The size of their mouth was not as big as my pinky finger. They moved very fast, even in the water or on the floor. When she was baby, little Caca had a habit : slept under my turtle doll. She slept as fast as she found the doll, she slept until I came and moved her to her own bed. When she opened her eyes, I just said "sshh ssshh" and caressed her head so her eyes closed, she slept until the next morning. Although their body was tiny but they ate very well, especialy Live. Live likes ate so much. Caca ate until his stomach full then she did not want to eat anymore. but Live, he ate and ate, looks never feel full. Look at him. he always can not be patient when looking at the food in front of him (this habit--until now). Talking about food. 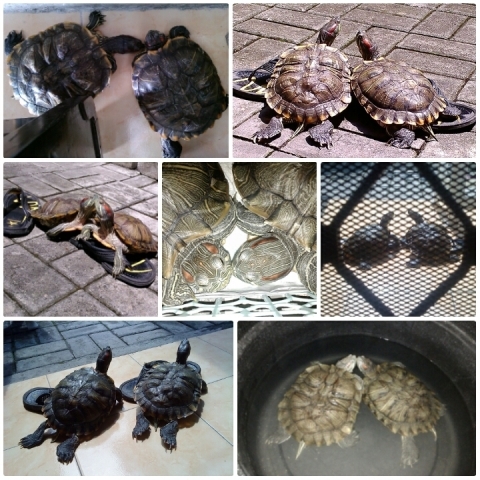 I usually give them feed of turtles called "pelet" in Indonesia. Pelet colour is green, small round design and crisp as crackers. And sometimes maybe twice a week, I feeding them with small fish or "caterpillar hongkong". When they were child, there was an incident. Live disappeared from his bed. I was looking for him for 4 hours around my house but I did not find him. I feel so hopeless and sad. Then I sat on the sofa in the living room, took a deep breath, and my eye still looked at every corner at the house. Suddenly, he came out from behind the sofa and touched my heel. Then he just walked away with the dirt on his body. I just said "Oh my god! This little turtle is mischievous". I must not be careless watching him. So, I decided to moved their bed beside mine. And this is their behaviour. They like slept under pillow. Before and after they went to my bed, I always clean them. So do not worry, they as clean as me ;). I'm so glad and be grateful because until now Caca and Live just once got illness. Caca got sick when his age was not until a year. She got a flu, her nose has phlegm and her eyes could not open. I tried to be calm and took care of her carefully : sunning her under sunshine every morning for fifteen minutes, cleaned up her own bed, cleaned up her body, cleaned up her small pool, communicated with her and feeded her ontime. Even she could not see, she ate very well. I'm so proud of her because she recovered quickly. She is strong turtle. 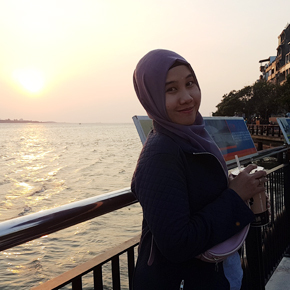 If our pet got sick but they still want the food, I can predict our pet can be well soon, because the nutrition from food is necessary for the body's healing process. Also, if our pet can be healed with traditional ways, do not rush to give them medicine. Let the immune system in their body work duly. If the disease cannot be healed, we have to go to veterinary, so our pet can get handling from veterinarian. Live got the same disease as Caca but he did not want to eat as usual. He just jumped and run as he like. And the next day, he did not like being in the water. I'm so worried about his behaviour. He did not like being under sunshine too. Every did sunning under sunshine, he was always running. I did not want him die because of illness. I did not give up. Every night I gave him warm water. If he did not want to eat pelet, so I did not give him pelet. I gave his favourite fish and feeded him with my own hand until he felt full. I did every day until his behavior returned to normal. Now, they are so big, so well and adorable. They always show me how to love each other, though sometimes they fight about their food. They clean, they strong and healthy, always waiting for feed time, exploring the house and the garden together, sunning under sunshine together, sleep together. They spend all the time with each other. Caca grow as a wise and lovely old sister. She always kiss Live and make me jealous. Hhrrgghh. She also like sharing her food with Live (although Live do otherwise). She always take care her young brother, Live. Live grow as childish and strong turtle. Loves eat and exploring the house. He cannot be separated from his sister. I thought he is dependence on Caca. I'm so glad having them. I hope they can be live and have a children.